Heart of the Huntress is a journey into archetypes of feminine power, using 5 Rhythms and archery to explore the light and shadow of power. Power, in this workshop, is simply defined as what it takes to move energy in the world. In a practical sense it is how we get our needs met. How do we bend our world so that we can have a nourishing life? How do we call on our resources to co-create with the universe? And how can we see our unconscious strategies, which result in unequal power dynamics, and can see us stuck in toxic relationships, with self, family, employers and the world in general. As babies and children we evolved strategies for getting our needs met, for expressing our power in the world, and these form the basis for the 9 archetypes we will be working with. The 10th, the Good Girl, is the roadblock... she is in the way for us to step into our power. The Good Girl looks after everyone else's needs before her own. BY understanding and dancing with her, we get to thank her for her lessons and lovingly lay her to rest, clearing the way for us to embody a clear yes and no. Archery is a beautiful way to actually feel what it is like, in real time, to go through a movement of power. 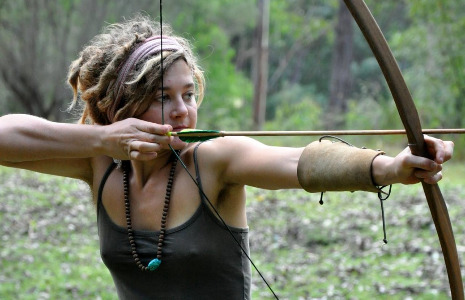 And Artemis, the Huntress, shows us the perfect balance of masculine and feminine. When to stay, when to go, when to wait, when to move, when to release, when to dissolve. 5 Rhythms lets us move with awareness through everything we find in our journey. This is a Waves/elective and counts towards student log hours.